At present, the nature and extent of upper esophageal stage clearance issues following nonsurgical management of nasopharyngeal cancer (NPC) is not well elucidated. 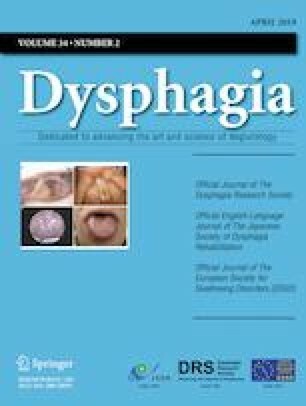 The aim of this study was to conduct an initial retrospective study of the prevalence and severity of upper esophageal clearance impairments in a cohort of patients post-NPC management. A secondary aim was to explore any observed relationship between severity of impairment with both (a) aspiration and (b) temporal oropharyngeal swallowing measures. A cohort of 134 NPC patients who received curative intent (chemo)radiotherapy (C/RT) and completed a videofluoroscopic swallowing study (VFSS) between 2012 and 2015 were reviewed. An Esophageal Clearance parameter, based on the scale used in MBSImP was used to classify the presence and severity of esophageal impairment on thin liquid and semisolids. Data on oral and pharyngeal temporal measures, pharyngeal constriction, and penetration/aspiration were also collected. The prevalence of cervical esophageal clearance impairment was high with ratings > 0 observed among 83% and 97% of patients on thin liquid and semisolids, respectively. With the increasing impairment, significantly (p < 0.05) increased oral transit times were observed for liquid swallows, and increased pharyngeal transit times for semisolids. Significantly higher proportions of patients presented with penetration/aspiration in the group with more severe esophageal clearance impairment. Results confirm that cervical esophageal clearance impairment is highly prevalent post-C/RT treatment for NPC. Causality cannot be determined from this study; however, this initial evidence supports that esophageal impairment may coexist in patients post NPC, presenting with more severe oral/pharyngeal deficits, and the impact of this on swallow function needs to be considered. Further systematic research is required. The authors wish to thank Dr. Laurelie Wall and Kelvin Tsai for their contribution in the interrater reliability data and also the speech therapists from Queen Mary Hospital who performed the VFSS from 2012 to 2015. GLOBOCAN. http://globocan.iarc.fr/Default.aspx. 2018. Accessed 1 Sept 2018. Authority TH. Cancerfacts. http://www3.ha.org.hk/cancereg/Statistics.html. 2018. Accessed 1 Sept 2018.